The calendar is already starting to fill up as we head into another new year. You have started thinking about the gift shopping, the party dress, and the haircut… why not also show up to your events with a brighter smile? It is one of the first things people will see and can provide a boost of confidence when you look in the mirror. After a year of morning coffees and weekend wines, a professional teeth whitening treatment in Ottawa can provide safe and subtle results. Whether you just want a little brightening or are seeking dramatic stain removal, the Spa-Dent treatment offered at Family Dental Care can provide the look you want. Natural Appearance: Some people worry that their teeth will take on a super-human, unnatural, or ‘glow in the dark’ appearance after experimenting with teeth whitening. While we cannot guarantee the results of at-home options, the professional teeth whitening offered at our dental clinic can be customized to your ideal shade. Confidence: If you have developed habits to hide or minimize the appearance of your teeth because their colour has changed over time, you can make a positive change today. Whether you have abandoned your favourite shade of lipstick, stopped wearing white, or cover your teeth when you smile, you can forget about having to adjust your choices to suit your teeth. Live life to the fullest and smile without hesitation. Dental Health: Certain steps may need to be taken before getting teeth whitening completed. Cavities should be filled and your dentist will inquire about your lifestyle and diet to determine the cause of the stains. The outcome? An overall dental checkup, necessary cavity treatment, and some time to reflect on your health choices. Plus, a gorgeous smile to celebrate the holidays. If you are not sure what to expect during your teeth whitening appointment, you can discuss the factors and method with your dentist. Typically, a whitening gel will be used after a protective substance is put on the gums and other areas of the mouth that are not being lightened. 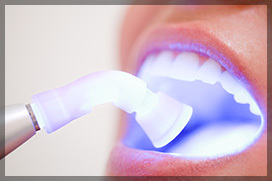 A special laser light may be used to accelerate the whitening process. Once completed, you will be given a fluoride treatment to minimize the side effects of tooth sensitivity and increase the strength of your tooth enamel. Family Dental Care provides each patient with attentive services and a range of dental options to support their overall health, confidence, and well-being. Patients of all ages are welcome at our dental clinic and we can provide dental services for every stage of tooth development. With convenient and flexible billing options as well as a wide range of treatments, you can rely on our trusted and friendly dental professionals for all your oral health needs. Want to reveal a bright, white smile for the holiday season? Call Family Dental Care at 613-736-5000 to book your appointment and learn more about our cosmetic dentistry services. Enjoy the festivities with your biggest and brightest smile. Happy Smiles, Happy Holidays!